For generations the name Albert Schweitzer has been synonymous with hands-on compassion and the power of Christ-like sacrifice. 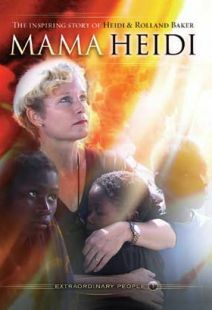 Now director Gavin Miller presents a landmark drama about the legendary medical missionary and Nobel Peace Prize Laureate. The year is 1949, the Cold War has begun and a climate of fear pervades. 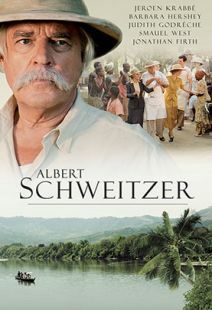 Christian medical missionary and theologian Albert Schweitzer (Jeroen Krabbé) is regarded as one of the world’s most eminent humanitarians due to his life saving work in Africa. But when Schweitzer takes a controversial political stand, powerful adversaries launch a smear campaign designed to discredit and silence him. His enemies sabotage his medical clinic endangering the patients and threatening to put an end to the work. Co-starring Golden Globe and Emmy Award-winning actress Barbara Hershey as Helene Schweitzer. Widescreen with Optional English subtitles. I was looking forward to this newly released movie because, although I had heard about Albert Schweitzer, I really didn't know much about him except for his work as a missionary in Africa. One of my favorite Schweitzer quotes is: "He who does not reflect his life back to God in gratitude does not know himself." He felt he needed to repay the world for the happiness which it had given him and decided that after he turned 30 he would serve humanity with Jesus as his example. Schweitzer considered himself French, but he was born in Alsace-Lorraine at the time it was German territory. He was a theologian, musical scholar and organist, philosopher, and author of The Quest for the Historical Jesus, published in English in 1910 and quickly became a well-known, respected book. His philosophy was called "Reverence for Life." 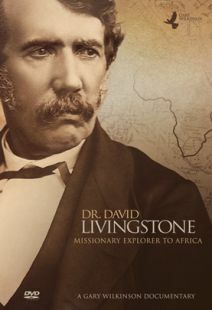 As a medical missionary, Schweitzer established a hospital in what is now Gabon, Africa, where he said of the villagers, who were not well educated, "they only knew the secret of life." Schweitzer won the 1952 Nobel Peace Prize. The movie, which stars Jeroen Krabbe as Schweitzer and Barbara Hershey as his wife Helene, begins in 1949. The Cold War is beginning and Schweitzer's friend Albert Einstein asks him to speak out about the dangers of the atomic bomb. McCarthyism was taking hold in the U.S., and the CIA considered Schweitzer's involvement a serious threat. A smear campaign was launched to discredit and silence him with threats of closing the hospital and sabotaging his work. Schweitzer must decide if he will follow his conscience or his life's work. Nobel Peace prize-winner Albert Schweitzer (1875-1965) was a renowned humanitarian, musician, theologian, and medical doctor. However, according to this 2009 docudrama, the CIA considered him suspect because of his association with Albert Einstein, as well as his outspoken views against the atomic bomb. 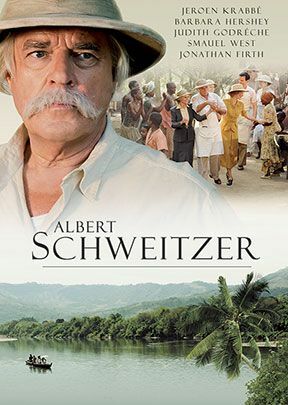 Directed by Gavin Millar, Albert Schweitzer finds Jeroen Krabbe playing against type as the gentle Schweitzer, while Barbara Hershey costars as his sickly, long suffering, but ever patient wife, Helene. The story opens in 1949—during the early days of the Cold War anti-Communist scare—with Schweitzer working at his hospital in Lambarene, Gabon in Africa. 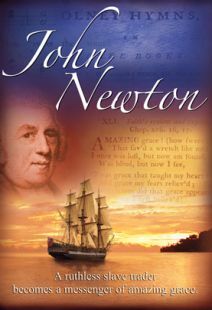 Schweitzer tends to lepers, but he struggles with primitive equipment and a chronic shortage of staff and funds, so he must interrupt his work to go to America to plead for financial support. Once there, he meets with Einstein, and also attracts the attention of a sympathetic photojournalist, along with a man who claims to be an admirer—wanting to raise money for the cause—but who really intends to follow Schweitzer back to Africa in order to do an exposé. While Schweitzer had an overriding "reverence for life," he was no plaster saint, coming across here as sometimes patronizing, autocratic, neglectful of his grown daughter, and inflexible (refusing to kill rats even though they spread disease in the African village). 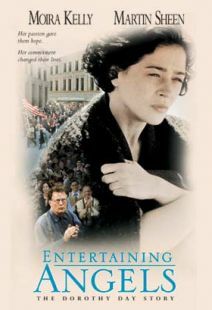 In addition to the drama tied to the CIA, the film chronicles Schweitzer's work to save his hospital, mediate conflicts among co-workers, deal with tribal superstitions, and stave off efforts by government officials to take over his operations. 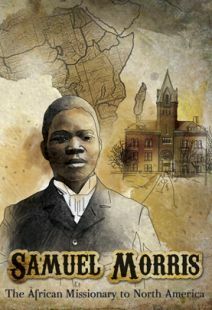 Handsomely filmed, this entertaining and informative biographical portrait is recommended.